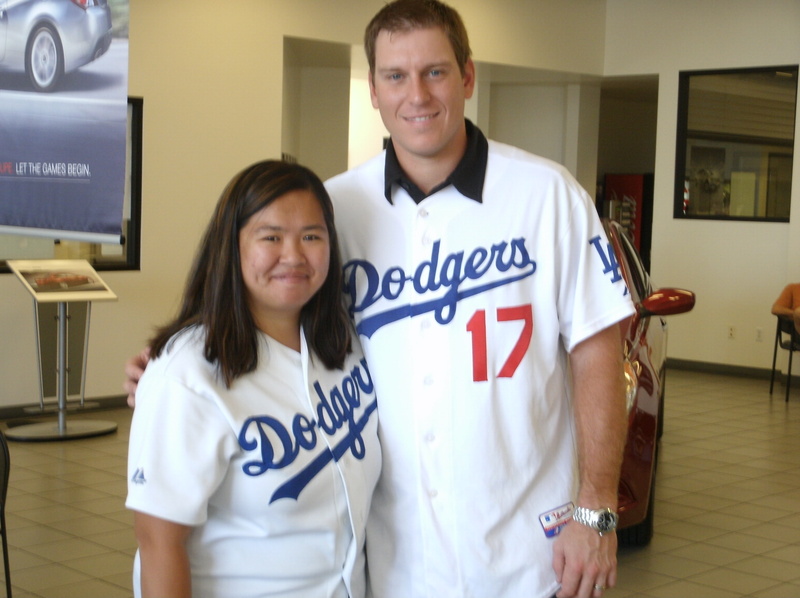 Before the trade deadline, Blake DeWitt was scheduled to sign autographs at the Hyundai dealership in Glendora. The week after Blake told us about it, and the day the Hyundai put out the ad, Blake got traded. 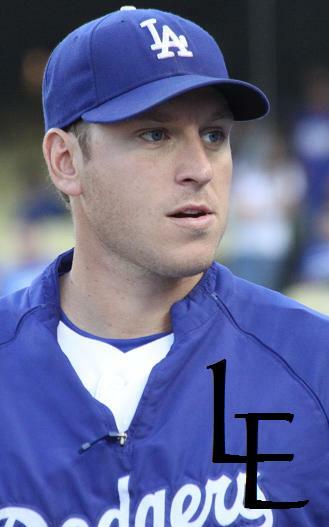 Instead, they scheduled for AJ Ellis to sign instead. I was excited. 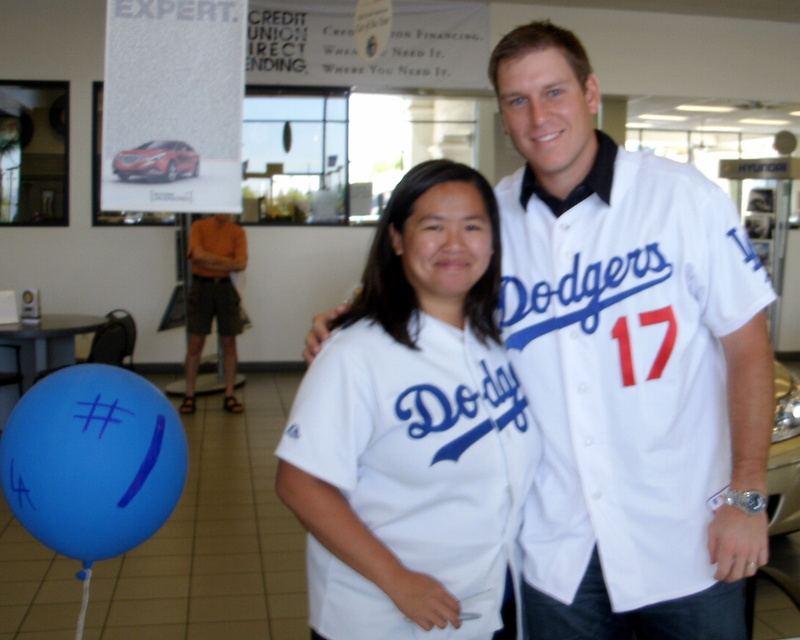 I had only gotten AJ Ellis at the stadium once (Photo day doesn’t quite count). Jamey Carroll was signing in L.A., but I wanted to go to AJ’s. Even though it was way over there in Glendora. I had no idea what time would be a good time to go. I know my friends were leaving for Jamey Carroll’s around 5 or so. I set my alarm, hit the snooze twice before getting up and heading out. Since it was early still, I turned on KABC to listen to the Peter Tilden show. I’ve heard the advertisements all season about winning baseline box tickets on the Peter Tilden show. When I got to the dealership, the gate was still closed. So I parked the car and waited for someone to come and open up. I waited probably about 25 minutes before someone showed up and opened the gate. I pulled out my chair and set myself in front of the store. Good thing I got a book, because I had about 30 minutes to kill before calling in. At 7:18, I started calling KABC … and I won the baseline box tickets! Yay! And just about that time, the next person in line showed up. Just in time to see me jumping around the parking lot. They let us in and AJ spotted me right away. He said, “you were the first one?” I laid out my scrapbook and he asked me what time did I get there? He guessed 7. I shook my head. Some of the employees behind me told him I was there before Jake (I think it was Jake) was. He showed up at 6:45 to open the gate and I was already waiting. He asked me if I bought a new car while I was there. I said I didn’t. He signed my book and a photo for Pat. I had some extra photos for him. He told me he had told the guys about my picture and he was bragging about it to them. I slid him the copies and told him he could have them if he wanted them. He was like, yeah! Now I have proof. Edward told me AJ liked the photo AJ signed for him. He and Sandra had the only two photos that were my images. I emailed one to Edward for him, and one for me. Sandra ended up with it. When AJ saw Sandra’s photo, he was like, “hey! Here’s the partner from the other photo.” AJ had asked Edward if he had caught the ball. When he saw Sandra’s, he was like: Okay, so I did catch it. Bad form, but at least I caught it. I don’t remember what he said verbatim, but that’s pretty close. Not quite perfect, but I’ll take it! That’s as good as it’s going to get. Afterward, I exchanged info with Eric and Sandra so I could send them the photos I took of them. And to get in touch on facebook. One of the employees came out and said, “hey #1 fan” and something else. Somehow I ended up back inside and helped the Hyundai employees take their group photo. It was quite worth getting up at the crack of dawn, even if in some people’s eyes it was just for AJ. I’ve always had a soft spot for catchers ever since I became a Dodger fan. There will be two player appearances tomorrow. Jamey Carroll and AJ Ellis. The Dodgers have been posting an announcement on Facebook now about the player appearances. So far Carroll’s announcement has a few comments, but AJ’s already is up to almost 100. And I gotta say, probably 90% of those comments are not of the positive kind. Here’s a few. DD: Who is he and will he refund the money I’ve wasted on this team? Good grief! Dodger fans deserve better! DC: Really? A.J. Ellis? Was Juan Castro busy that day? Come on man.! EP: he still is a rookie and hasen’t been playing everyday until now but give him a break he should improve. don’t be so screwed up. EL: Jesus look at all the folks ragging on poor AJ. Dude is just a 3rd string catcher lol lay off man! FM: Ellis should be making appearances in Albuquerque where he belongs. CL: If I throw a ball at him, will it fly right by him like the game last night??? talent does not beat hard work. JR: dodger fans don’t give carroll enough credit for everything he has been doing for us . CR: I am SOOOO excited!!!! I would do ANYTHING for this man!!! I LOVE HIM!!!! MN: Maybe the Dodgers can one of those “Easy” buttons and put together some wins or new ownership! Guess who’s going to have the bigger crowd tomorrow? There were a few negative comments in Carroll’s comments, but only like one or two were actually directed at Carroll. Not like Ellis where the majority of the comments were negative, and even then it was split between management, individual players, the team, and AJ. Don’t worry, AJ. There will be two fans there who don’t fall under the three categories that LH listed. Even though Carroll’s signing is much closer to my house, I am going to drive all the way out to Glendora to support Ellis and the Dodgers. Someone’s gotta show up and represent right? 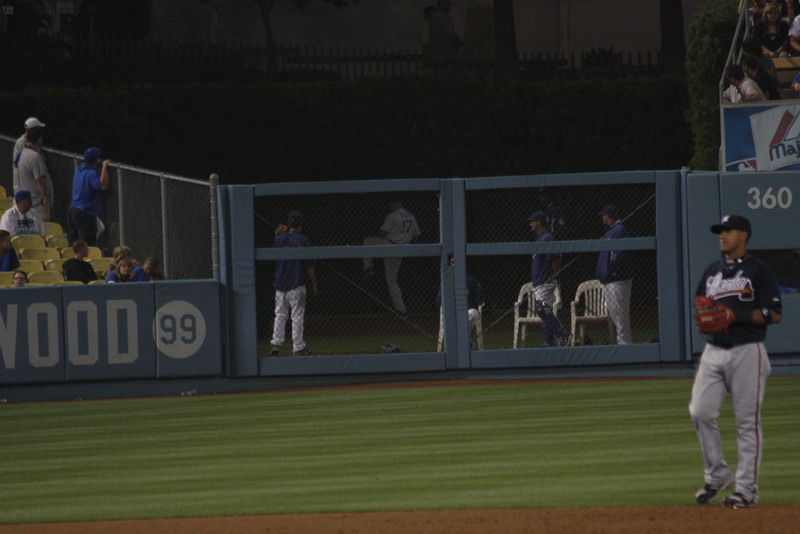 In the bullpen on Saturday night’s Dodger game against the Braves in the 8th and 9th inning with the Dodgers trailing the Braves 9 – 2 (Dodgers scored one run in the bottom of the 9th to finish the game 9 – 3). I couldn’t believe my eyes when I saw action in the bullpen. I figured Kuo wasn’t an option, Broxton and Weaver weren’t options… so who was left since Troncoso imploded, Belisario was done, and Haeger was mopping up. Can you see the name on the back of the jersey? LOL yes I know you have to click on the picture to make it bigger. How about now? If you can’t see the name, you can at least see the number. 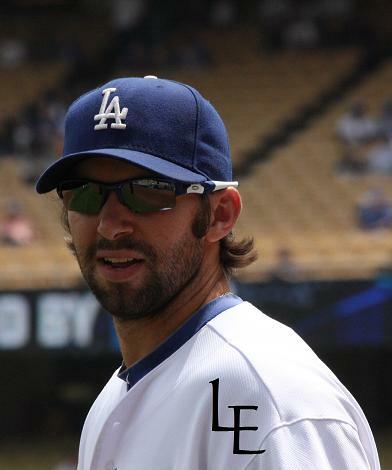 Who wears #17 on the Dodgers? No, not Jason Repko. He gone. It was confirmed on Dodger Talk when I stumped Ken Levine and Josh Suchon. They thought I didn’t know, but I surprised them. They were surprised. They were flabberghasted. They got excited over the possibility that AJ Ellis might have had a chance to pitch. If they archive the Dodger Talk, I’ll post the link and tell you at which point I come on. It was probably one of the better calls of the night, if I do say so myself. Josh sounded giddy at the prospect of asking Joe Torre about it tomorrow. Since I won’t get to hear the response, I hope someone out there will and post a reply so I can find out. Maybe it’ll be in the paper. But Ken and Josh said that their vantage point from the Press Box doesn’t always give them a great view of who is warming up in the bullpen. Basically when I said it was AJ, Josh was like “FROM THE MOUND?” I was like, yup. Wind up and everything. Josh got real excited about the possibility that had Charlie Haeger imploded and if the Dodgers deficit became greater … that Andrew James Ellis could possibly have relieved Charlie Haeger in the 8th or 9th inning. You heard it here. You see for yourself. I personally would have loved to have seen AJ pitch, even if it meant the Dodgers were losing more than they were. Hello, the score was already 9 – 2 at the time in the Braves favor.